A3 size, printed in 4 Colors, 7-sheet set. A disciple of Utagawa Toyokuni the first. Later, he succeeded the master and became Toyokuni the third. He was born in Honjo in Edo. His real name was Sumita Shozo. He learned Ukiyoe under Toyokuni the first and showed his talents in portraits of actors and courtesans in the name of Kunisada. As his family had a share of the ferry at Itsutsume in Honjo, he renamed himself Gototei. 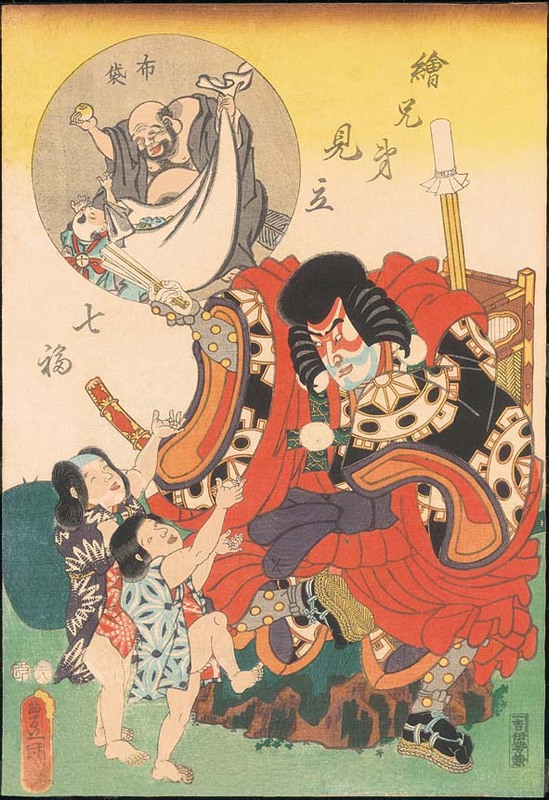 When he called himself Gototei, he was best reputed and reached his prime, producing portraits of courtesans and actors, which represented the late Edo style, based on the Edo sense of beauty such as “iki” or “hari.” He was one of the most popular Ukiyoe artists in the late Edo period, making the Utagawa school the largest school in the world of Ukiyoe. 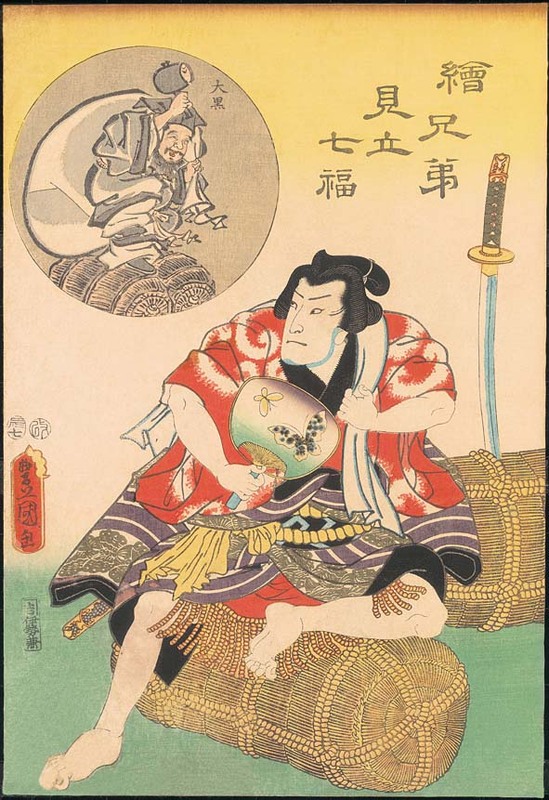 He happened to be in the same generation as Sharaku or Hokusai and today his greateness may seem diminished behind their fame, but still his portraits of actors, the most popular in his time, are the richest works in the sense of design in the Edo period. The seven gods are believed to bring happiness and fortune. Their names are Ebisu, Daikokuten, Hotei, Jurojin (or Kichijoten), Fukurokuju, Bishamonten and Benzaiten. Folk religions in India or China, such as worship for the seven wise men in the bamboo forest, are rearranged this way in Japan. The seven gods are represented in the play by Kabuki actors. As this is a very lucky item, please enjoy the pictures and wish for happiness of your family, success and prosperity of your business. 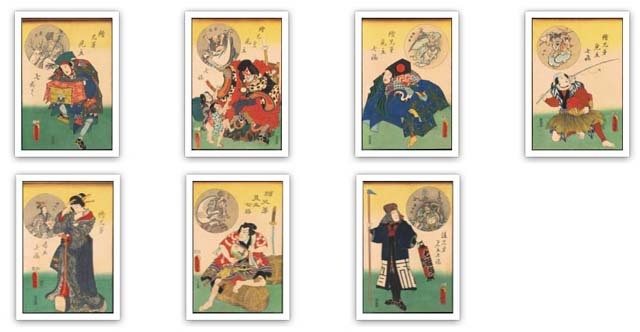 Please look at this cool prints and others in our online store under the ukiyo-e category!